You are at:Home»Food»Are Sainsbury’s New Wellness Hubs The Future Of Retail? Are Sainsbury’s New Wellness Hubs The Future Of Retail? LONDON, United Kingdom — British supermarket chain Sainsbury’s is taking on rivals Holland & Barrett and Planet Organic, with the launch of new wellness hubs in selected stores. The strategic move, which will bring the grocer’s entire range of wellness and sports nutrition products together in-store for the first time, targets the rise of health-conscious consumers looking for convenient and accessible solutions. By tailoring its in-store experience to meet the needs of these consumers, Sainsbury’s hopes to strengthen its wellness proposition and fend off increased competition from competitors. “Wellness and sports nutrition are areas that are becoming increasingly popular with our customers,” explained Paul Mills-Hicks, Sainsbury’s Food Commercial Director. Featuring approximately 500 new products, from brands including Grenade, Optimum Nutrition, Women’s Best and Tisserand, alongside specialist products such as hemp water, bone broths, activated nuts and superfood powders, Sainsbury’s will be the only supermarket to sell exclusive brands such as No 1 Kombucha, Tribe and Curators. It is hoped that new fixtures will help to differentiate the wellness hub in the store, while chiller cabinets will offer customers ready-to-drink, chilled sports juices as well as soft drinks, including drinking vinegars and egg white smoothies. Catherine Farrant, Founder of Ossa Organic, which will stock its range of organic bone broths and raw A.C.V based tonic in the hubs, is excited to see a supermarket prioritising functional foods for consumers. “This will be a big movement in 2019. We believe in the restorative, healing properties of natural food, and that disease and inflammation in the body – which is so commonplace – can be treated with foods that heal and seal the gut lining,” she commented. According to MISSFITS Founder Tara Adlestone, whose range of all natural protein powders will also be included in the hub, the grocer’s move highlights just how mainstream wellness is becoming. “Sainsbury’s clearly understands the growing demand from consumers for a one-stop health and wellness shop within its stores as it continues to evolve from a once luxury to a dominant lifestyle value,” she told Welltodo. “It’s amazing to work with them on this project and grow this new category together,” she added. 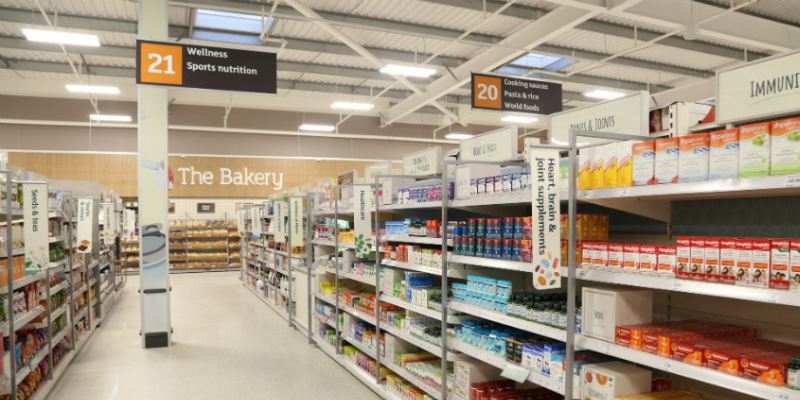 For now, Sainsbury’s will trial the dedicated wellness hubs in just seven supermarkets –– Selly Oak, Newbury Park, Watchmoor Park, Coldhams Lane and St Clares have already launched, with Cheadle and Lee Green following in January 2019. If successful, the format will be rolled out to more stores next year.